Arctic sea ice has likely reached its annual minimum for 2018, according to the National Snow and Ice Data Center (NSIDC). 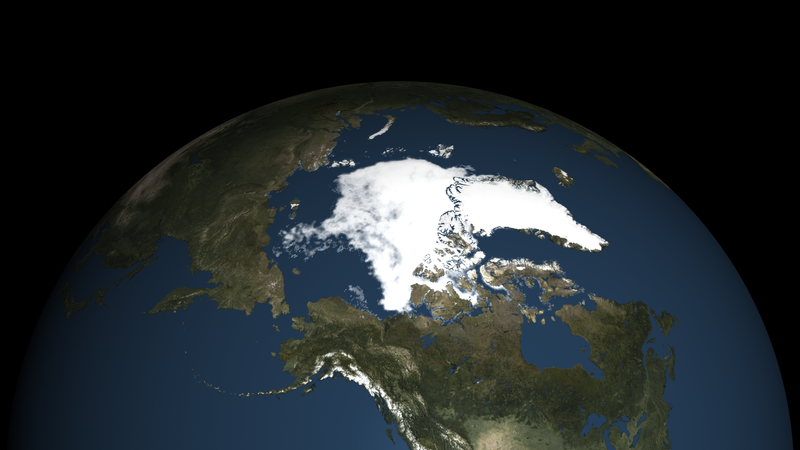 Sea ice extent shrank to 1.77 million square miles (4.59 square kilometers) on September 19 and again on September 23. Since then, ice extent has grown again, signaling an end to the summer melt season. While the 2018 ice extent was not as extreme as the record low set in September 2012, it tied both 2008 and 2010 for the sixth-lowest area since satellites began measuring sea ice nearly 40 years ago. The NSIDC reports that the 12 lowest Arctic sea ice minimums have all occurred in the last 12 years. This year's minimum also occurred nine days later than the normal date of September 14. This map shows sea ice extent as measured by satellites on September 23, 2018. Areas with at least 15 percent ice cover appear in shades of gray-blue to white. Open ocean water (less than 15 percent ice cover) appears navy blue. The yellow line indicates the long-term median sea ice extent on September 23 for years 1981-2010. Sea ice extent in the Arctic is declining in all months, but the decline is largest in September, which is historically the end of the summer melt season. In recent years, sharp declines in summertime ice extent are causing slower ice expansion in the fall. When sea ice is slow to re-form in October and November, Arctic coastal communities are especially vulnerable to battering waves and flooding that accompany winter storms. Learn more at Climate.gov. An unlabeled version of this map is available here.